Life is getting caught up and back on track. Thank you for your good wishes and thoughts. It was a difficult time - very surreal, and I'm not sure if it has hit me yet. Not sure how to explain it. But I'm keeping busy, and that tends to get me through the ups and downs of life. 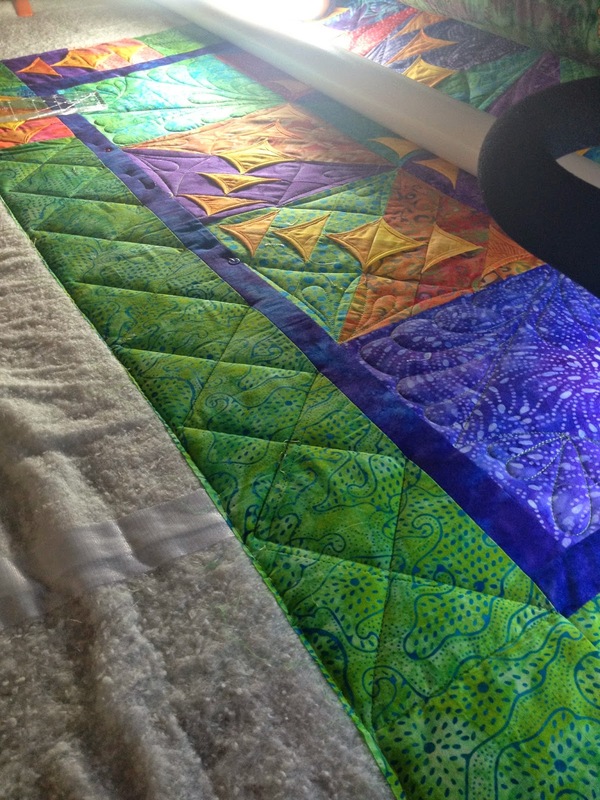 I've been behind, very behind in my quilting, and with kids on summer vacation, I'm trying to juggle time with them and time to finish up quilts. Getting there! Had a few beauties to share with you. 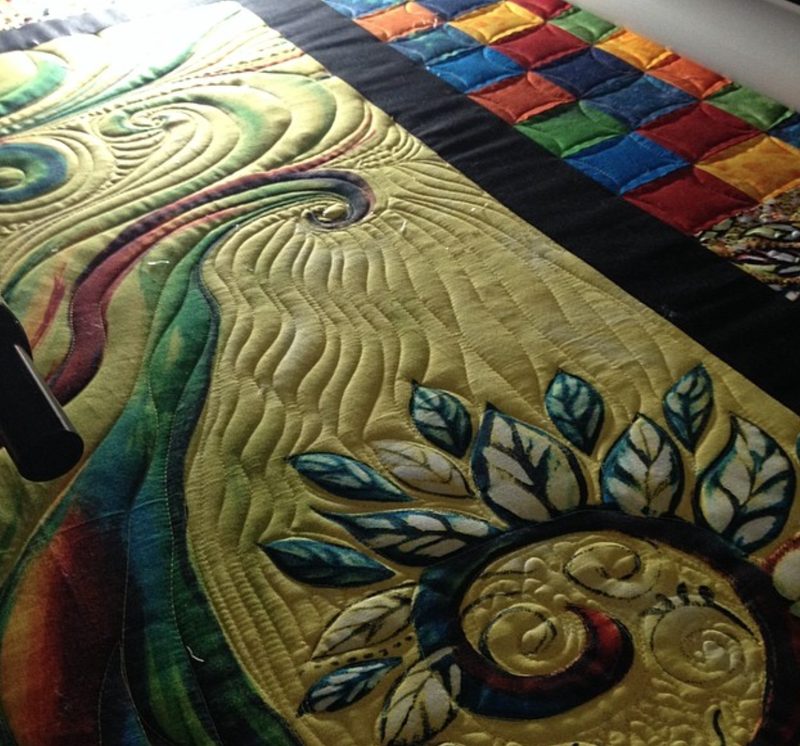 I always feel so lucky to hear the stories behind the quilts, and also just the creativity of the piecing. This one is a beautiful wall hanging - on its way now to Burkina Faso in West Africa. 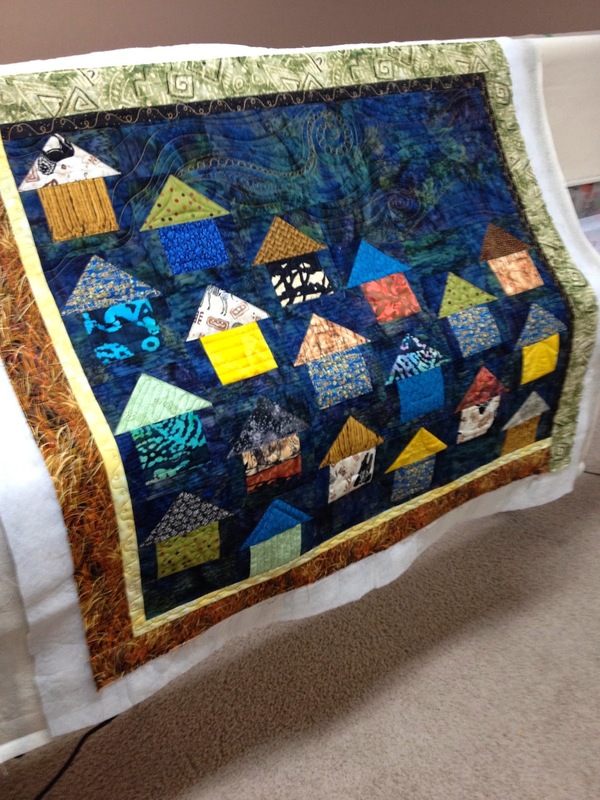 I got to play a bit on it, so I added swirls and waves to the background..
and individually quilted each house. I adore this one...the colours are striking and I love the centre panel. The person who pieced this just wanted me to quilt it however I want. These are dangerous words for me. 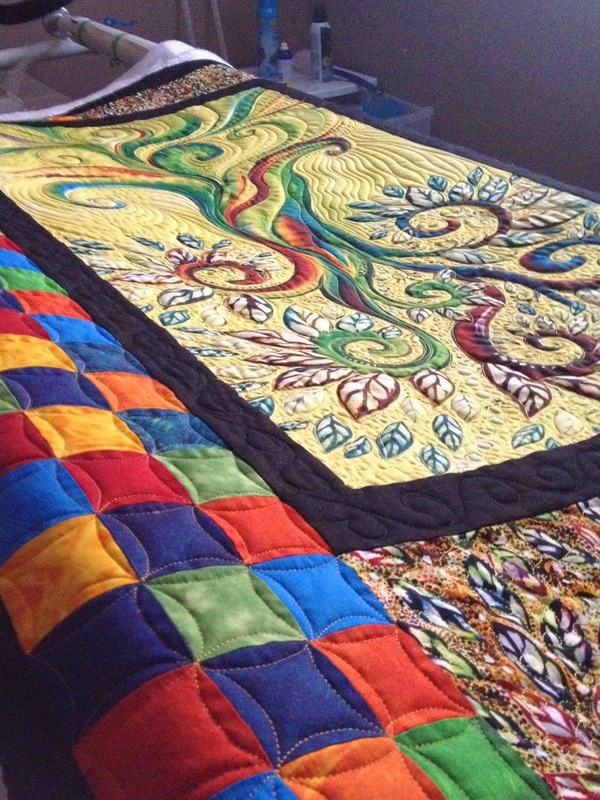 I love the freedom, but I do not like not knowing if my quilting represents the taste of the owner. I used the outlines and paint strokes of the centre panel to quilt it. 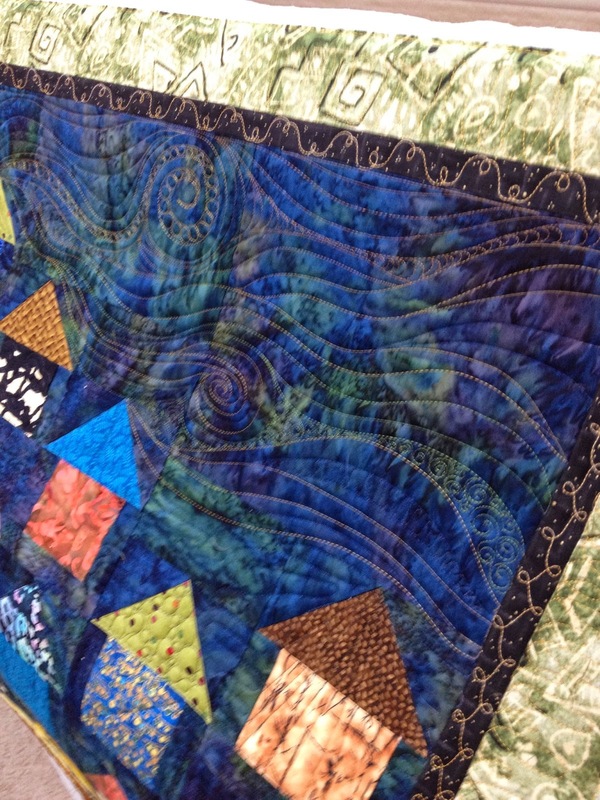 I used continuous curves on the bright squares of the borders, lighter quilting. This one was very fun to quilt. I loved outlining the tree and the leaves to give them some pop! This one is just so beautiful in person. You know when the colours and image just 'speak' to you and represent you? This is one of those for me! 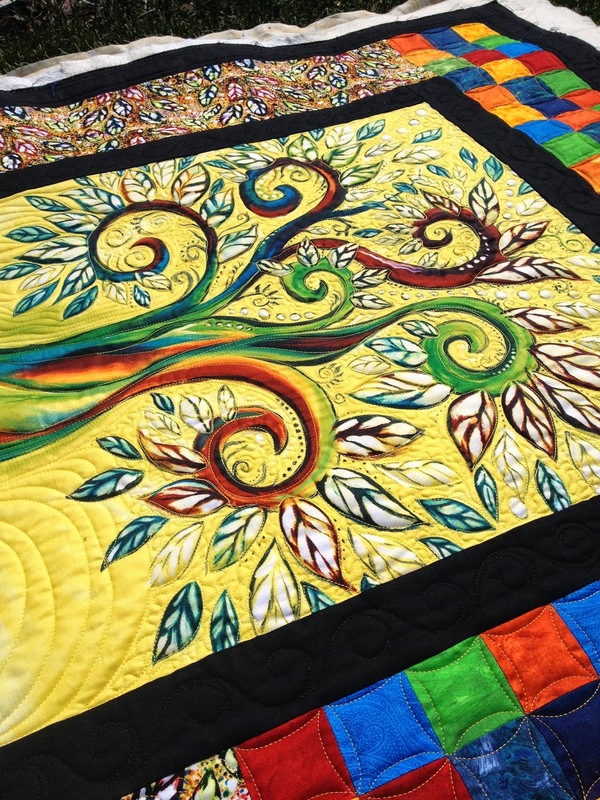 The piecing and colour choices in this next quilt are just stunning. I love how the flying geese are 3 dimensional. I auditioned a few designs using Concepts app on my iPad. 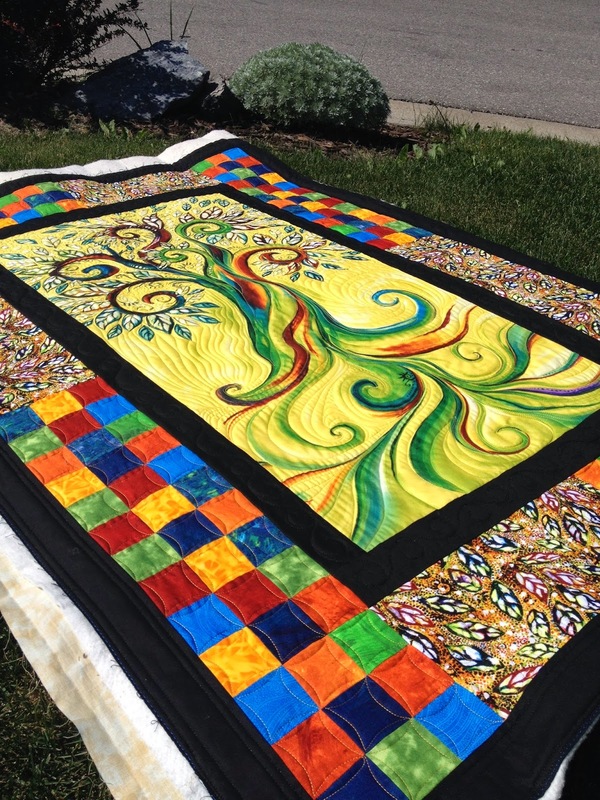 This app has been invaluable to me - you take a photo of the quilt top, draw on the photo (using any colour you choose), erase, enlarge areas, etc...and then you can email the photo! Perhaps I will do a post one day on how I use this app. Curvey triangles with tear drops inside, and some feathers in other parts. 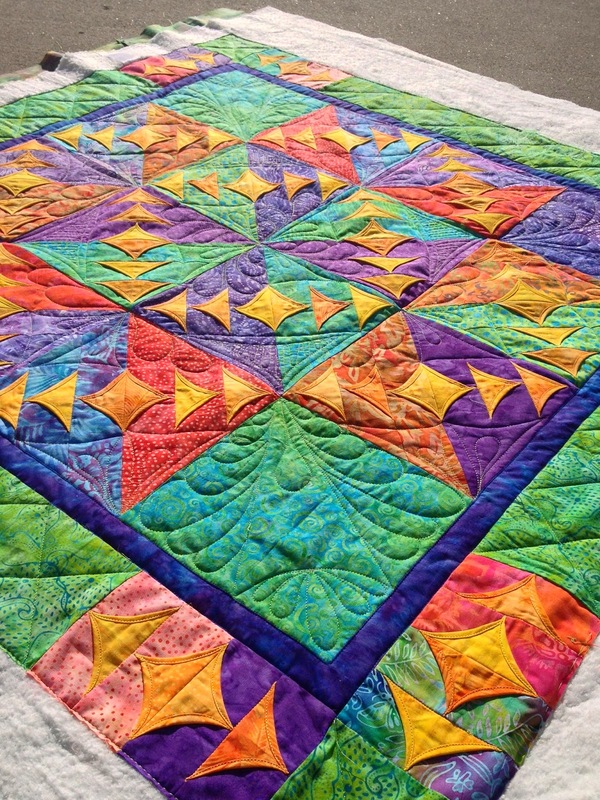 I love the brights in this quilt. 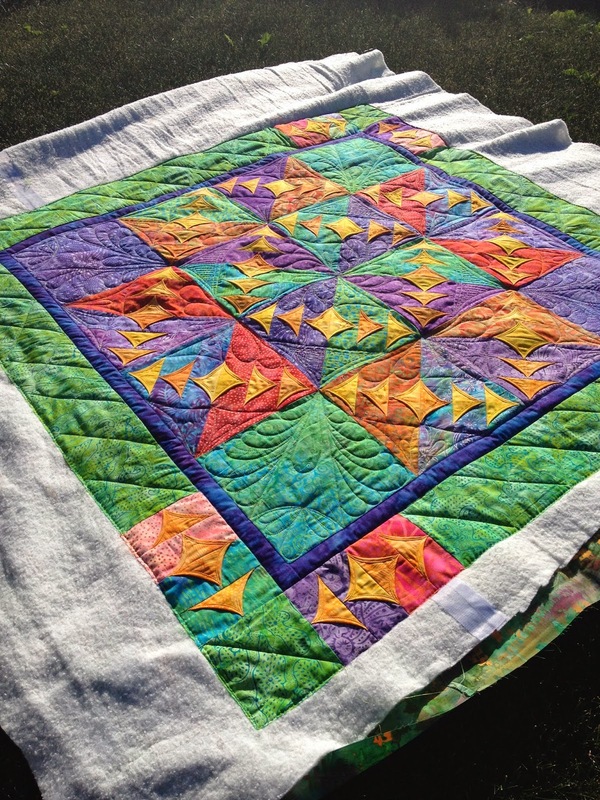 I've done a bunch of other quilts as well, free hand edge to edge designs which I will post another time. I always post an 'in progress' photo on instagram if you are interested in what I am working on! My tag name is urbanquiltworks. 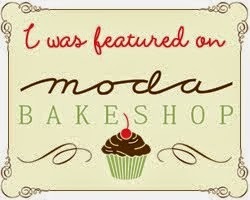 Or just click the button on the top right of this page to take you there! I find I enjoy the quick photo and post on instagram - it is quick and easy, and I don't have to be as creative in thinking up a blog post! First world problems, I know. Next up is a quilt which I am 'baking' a design for. My goal is to get it done in the next 2 weeks, so that I can enjoy some vacation time! Stay tuned! After vacation, I really need to get that "First Year Longarm Reflection" post done, as well as reprioritize my schedule and get something that fits in fitness (what??) 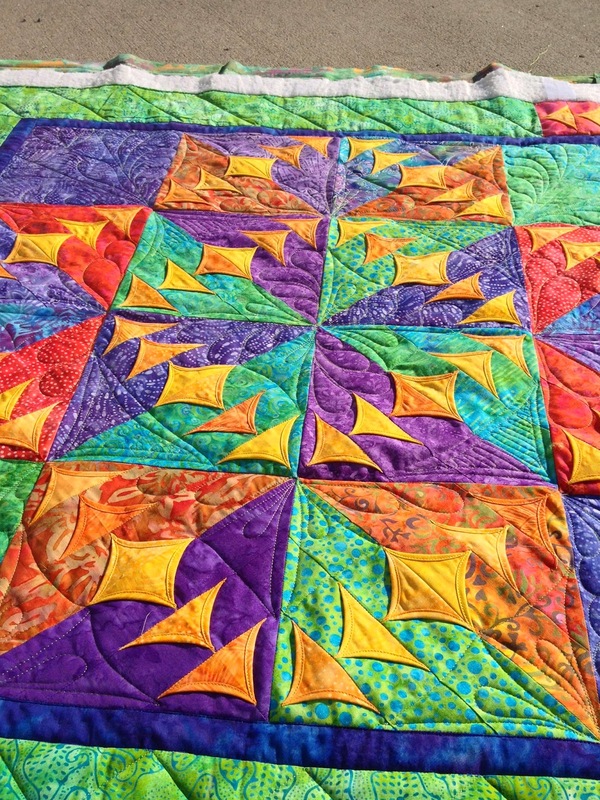 dog walking, quilting, groceries, cleaning, errands, and time for ME quilting! Any ideas on how to do that? I think I know. Disconnect my cable and internet.